Find hotel near Munduk And Melanting Wate .. There are two waterfalls here both of which have multiple names. 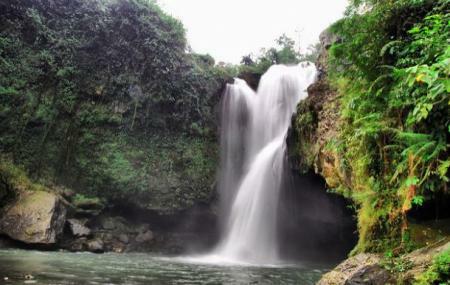 Munduk Waterfall is also known as Red Coral Waterfall and Air Terjun Tanah Barak. Melanting Waterfall is also known as Air Terjun Laangan. Now that the names are out of the way, let's talk about the actual attraction. 800 meters above sea level, the mountain villages of Mondo and Milan things are considerably cooler than the areas closer to the shore. These two waterfalls, while not nearly as impressive as those you would find in other places in the world, are literally nothing less than pretty as a picture. They are the definition of what a waterfall should be: an endlessly scintillating liquid curtain falling into a pool, surrounded by green vegetation and rocks on all sides. The waterfalls are not on the main road, so you will have to park, and walk between 300 to 500 meters before you can reach them. The path can be a little muddy. They are also not together, though they are not very far apart. How popular is Munduk And Melanting Waterfalls? People normally club together Jemeluk Beach and Nungnung Waterfall while planning their visit to Munduk And Melanting Waterfalls.